The sunroom space attracts and floods natural light into one room that makes it a very versatile space — but is there a better flooring option for your sunroom? The sunroom can vary it what it is used for from season to season — the fall and winter may serve as a greenhouse for your plants that cultivates a refuge from the cold weather, while the summer may usher as a yoga space with an abundance sun salutations — whatever it’s being used for, the flooring plays a crucial role in the function and aesthetics. With a vast collection of flooring options, Shelby Design Center has the perfect flooring — including hardwood and carpet — to envelope every room in your home. 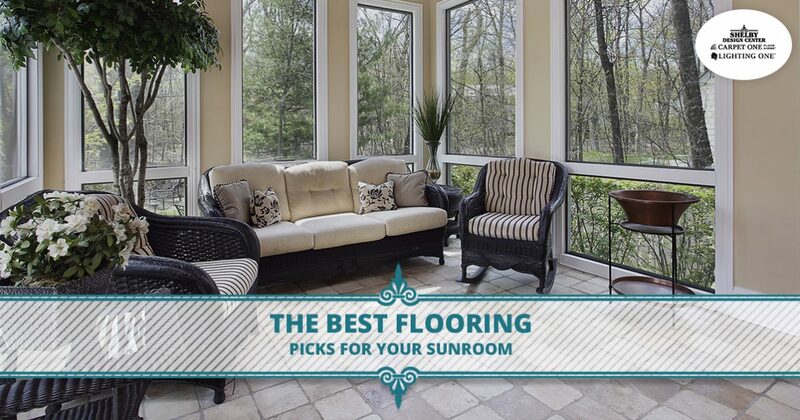 Join us in today’s post and learn more about the best flooring picks for your sunroom. Flooring for Your Sunroom, Isn’t it All The Same? When it comes to crafting and designing the perfect sunroom space, not only are aesthetics important but the type of flooring you choose is quite impactful as well. 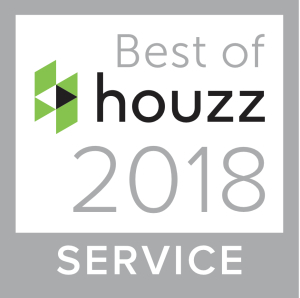 The sun is bright and it can warp colors – The sun is amazing at bleaching things which is why we hang our whites outside on a laundry line, but in a sunroom, color can be its nemesis! If you are thinking of a rich dark carpet, it will likely become warped and quickly fade in a sunroom. The same is true for rugs — you’ll know exactly where the sun hits it based on where the faded parts are! If you are set on carpet, consider a light color or ask about UV protected fibers. The season can affect the temperature – The summers can make a perfect oasis for morning yoga or as a cozy reading room, but in the winter, the temperature can be brisk. If you spend a good deal of time in your sunroom, you may want to think about how the type of flooring will affect the temperature. Carpet makes things a bit cozier, while hardwood and tile and be chilly. Concrete has become a great flooring option for sunrooms because though it may seem counterintuitive to have in the winter months, you can easily add radiant heat to your flooring — heated floors are the best in the winter! Carpet is always in the running for the best option in sunrooms — it’s durable and comes in a variety of colors and styles. Choose a low-pile carpet for your sunroom for easy maintenance and longevity. Tile is a great option because it is low-maintenance, durable, and can match many different styles of furniture. Tile is also beneficial to have in the hotter summer months, keeping the space a more comfortable temperature. There are many flooring options on the market and choosing the optimal type for each room can be overwhelming. 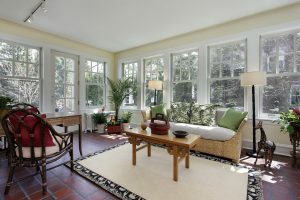 Consider what your sunroom will be used for and choose a flooring type accordingly. Concrete, carpet, and tile are all wonderful options. Do you need additional assistance picking out flooring for your sunroom? Connect with us today!